Appearance (0-20): This is a nice dark brown maduro stick. It isn’t oily to the touch, and looks well put together. There are no blemishes to speak of that would take away from the cigar. Perdomo generally does a pretty good job with their bands. This one sports a pretty large band, with different colors and embossing that signify what lies beneath. Well done, but nothing spectacular to really be an attention grabber. Construction (0-20): Everything seemed good upon initial inspections. There were no physical flaws, so I decided to light it up. The stick burned a little bit uneven after about an inch, which forced me to do a quick touch up with my lighter. Other than that, it was smooth sailing the rest of the way. The draw was easy and gave an ample amount of smoke, and the burn was cool until the finish. The ash was light gray, and held on about a quarter length of the cigar. Strength (0-20): This kind of deceived me with the dark maduro wrapper. I was expecting something a bit fuller, but it wasn’t bad. It starts off pretty mild in strength, and creeps closer to medium as you smoke. This cigar is more about flavor over strength. Flavor (0-20): Right off the bat, you will jump right into chocolate and coffee. When I say right off the bat, I mean it. The first puff of the cigar will give you those flavors, and I didn’t get any spice to be noted. From my experiences, many cigars with this flavor profile will give you some spice for balance; I didn’t get that here. Other than that, the flavors were bold and consistent from start to finish. This would be great with a cup of coffee or milk. Value (0-20): This is priced spot on. It’s a great stick for anyone who is looking for full chocolate and coffee taste, without having the break the bank. If someone needs an everyday smoke that isn’t bland or mild, I would recommend purchasing some of these. 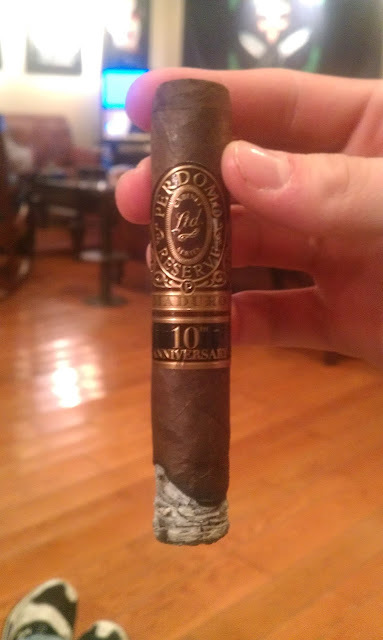 Overall (0-100): Perdomo isn’t high on my list of cigars, but I was pleasantly surprised. I enjoy the Noir and ESV line, and this is one more that I will add to the list. This is a great value stick for anyone who needs a nice “after dinner” cigar. I recently rated the Obsidian which has a similar flavor profile. The Obsidian did have the better spice-sweetness balance, but the Perdomo has much more robust chocolate flavor. Between the two, I would spend the extra $0.50 or $1.00 and grab the Perdomo. So where are you located? I've seen others mention this cigar as being quite a bit higher, thought perhaps you were in a low-tax state. We are located in PA, literally within 15 minutes of Cigars International. However, I believe the size (5x54) can be picked up online for that price.